The EWN-R Series electronic metering pumps offer superior high speed dosing capability with more standard features. The flexibility of the EWN-R pump enable it be integrated into virtually any chemical feed application using a universal-voltage, digital controller with an expanded set of control features. Superb valve performance and advanced solenoid engineering combine to make a highly precise pump for the most demanding applications. EWN pumps have outputs to 6.7 GPH (25.2 L/h) and a maximum pressure of 290 PSI (20 bar). The high speed of operation results in high resolution chemical feed and long service life. Quiet and compact, the EWN pumps prime in seconds and hold prime reliably. Iwaki’s New EWN-Y Series Electromagnetic metering pump with the revolutionary EFS Flow Sensor provides precise flow monitoring, feedback and control. The new EWN-Y electromagnetic pump combined with EFS flow sensor provides accurate real-time control and display of dosing rate. Set point control allows the desired flow rate to be simply programmed into the pump. 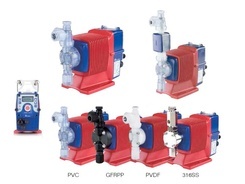 Through feedback from the EFS sensor, the pump constantly adjusts its speed to maintain the set dosing rate - even under changing temperature, viscosity or suction and discharge pressure conditions. The EFS is mounted directly on the pump for accurate dosing rate measurement - ALL WITHOUT ANY TIME-CONSUMING CALIBRATION.